Hello my wonderful friends and welcome back to another Project Challenge! What does that mean for those of you who are new? 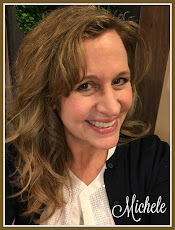 It means that I, with a few of my favorite blogger friends, have challenged each other once a month to share a project that we create using an assigned material. This is done in hopes that we will complete some of those projects we have been putting off for some time, as well as inspiring you to do the same! This month's chosen material was chicken wire or screening. Origionally, I thought I would finally finish those screen doors I've been putting off for the back doors, but then I decided to finish a project that has been sitting and begging for completion for the last few months. I have this "trouble spot" in my dining area next to my fireplace that has been a decorating challenge for me throughout the whole 10 years we've lived here. Though I like the open shelf country look, this just wasn't working for me. Finally, while on the Sweet Salvage (where I have a retail space) Facebook page, I saw a cabinet that I had seen in the shop, but struck me as I viewed it on the computer. I Knew then what I wanted to do with this space. Why not make it into a cupboard?! 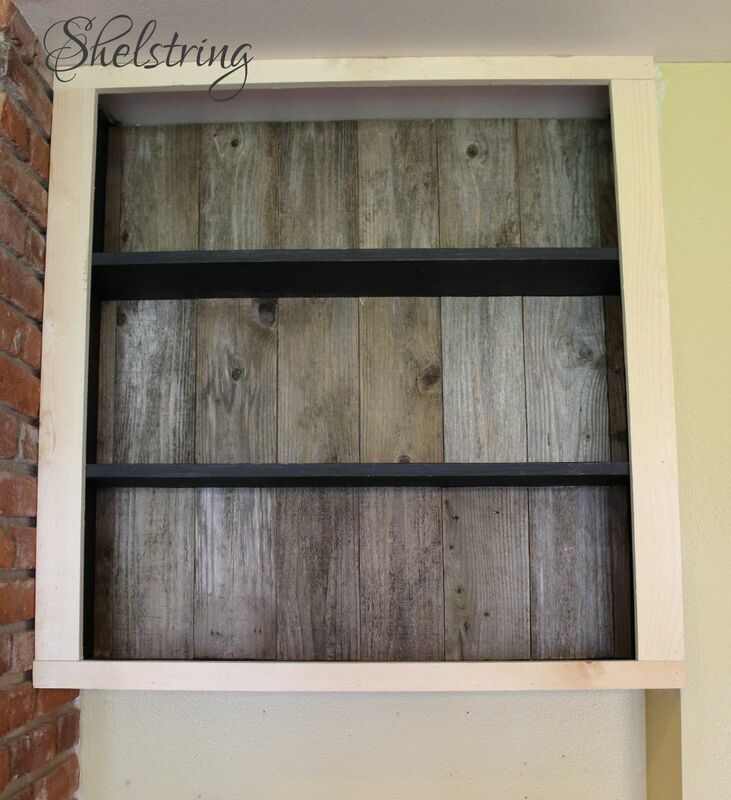 First I backed it with some of our old fencing and framed it with pine boards leftover from the board and batten in our little girl's room. Then I made doors and backed them with chicken wire. This was a fail because the sides of the doors were rickety, there was a split right down the edge of the left door, and the hinges were too small. Thus, the reason for the months of dely. 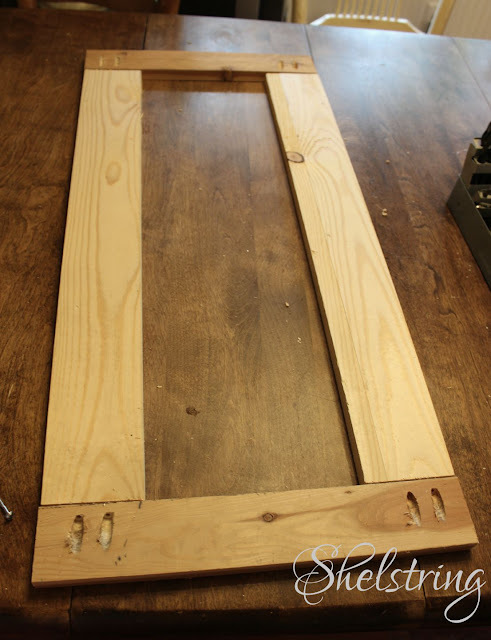 First I cut all the boards down to size, making the wood of the frame wider. These are 4" pine boards on the sides and 2 1/2" on the top and bottom. 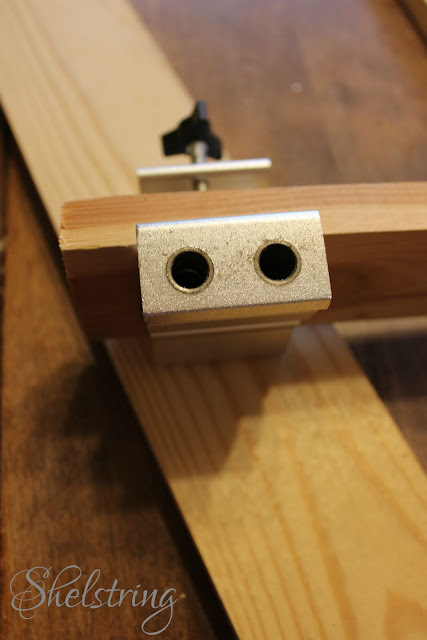 I drilled a pocket drill hole (from my new toy...*squeel*--perk to new projects!) 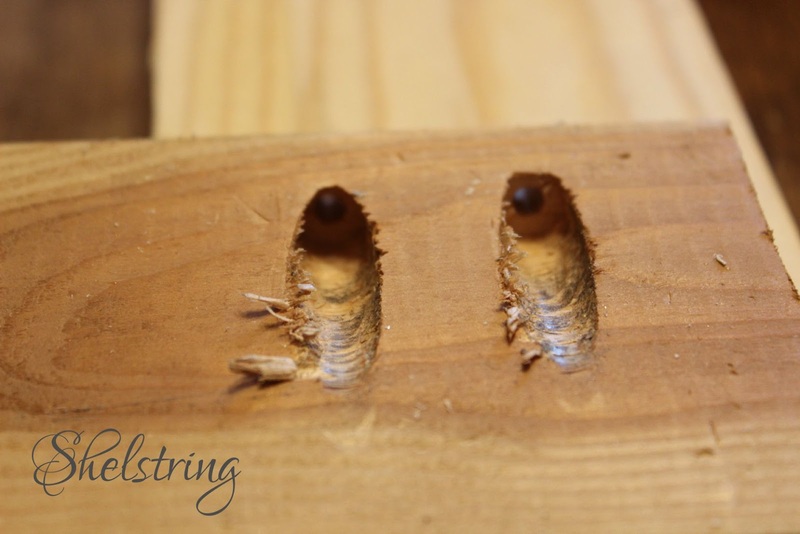 into each side of the top and bottom boards so that they would be more secure this time around. This was part of the reason I created new doors, the boards weren't wide enough to do that before. Then I secured the boards in place with 1" screws. Next I primed the boards with two coats of water based primer, and painted with another two coats. 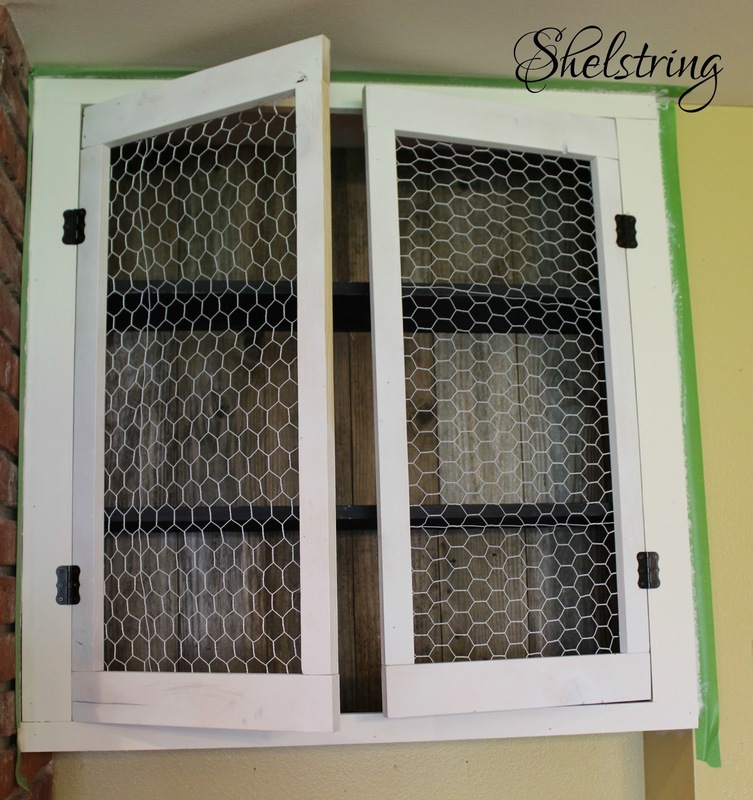 After adding chicken wire to the back, they were ready to hang. 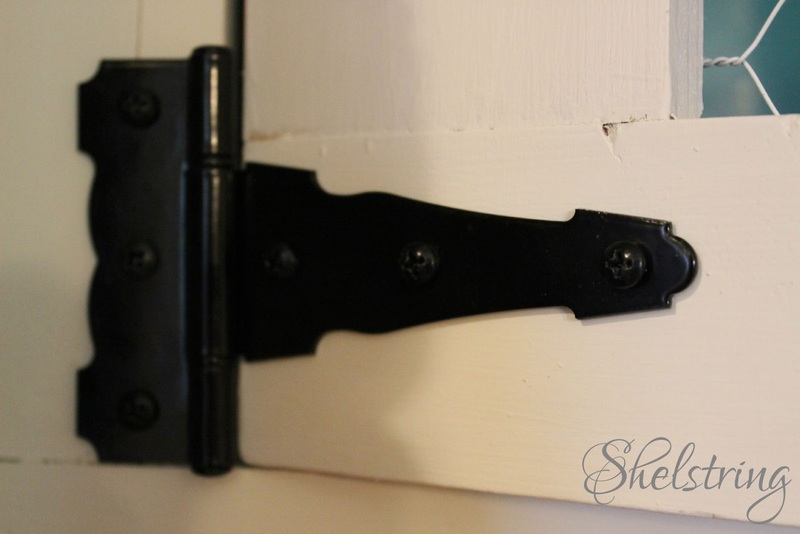 I used gate hinges because I had an epiphany that they would add the perfect look and character, while being the right size for the doors. This was the funnest part for me! Then I added gate handles to complete the look. Adding the dishes that I inherited from my great Aunt Stella, was like the frosting on the cake. I had displayed them on these shelves before, but never did I love it the way I do now!! 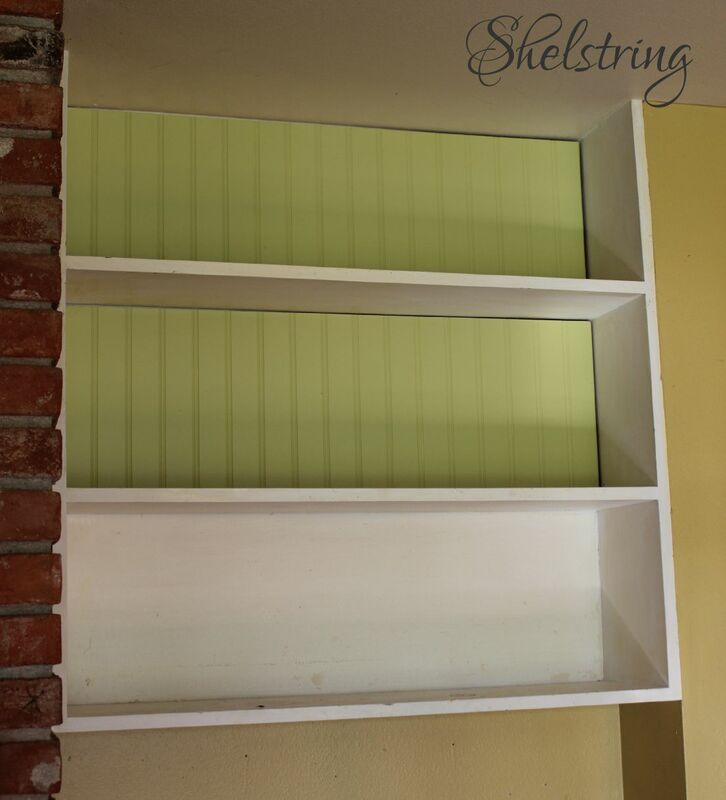 Now, that awkward space has become the perfect home for my very treasured keepsakes and keeps precious memories in open, yet safely closed, view. only accessible for when we use them. Hehe! What do you think? Can I chalk it up to another successful Project Challenge? Next month's challenge? A rusty item. I'm rubbing my hands together for this one!! 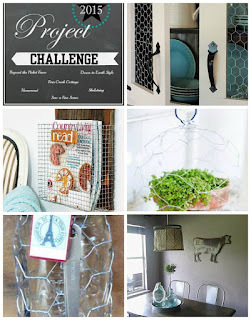 go check out all the inspiring projects my other blogger friends came up with! 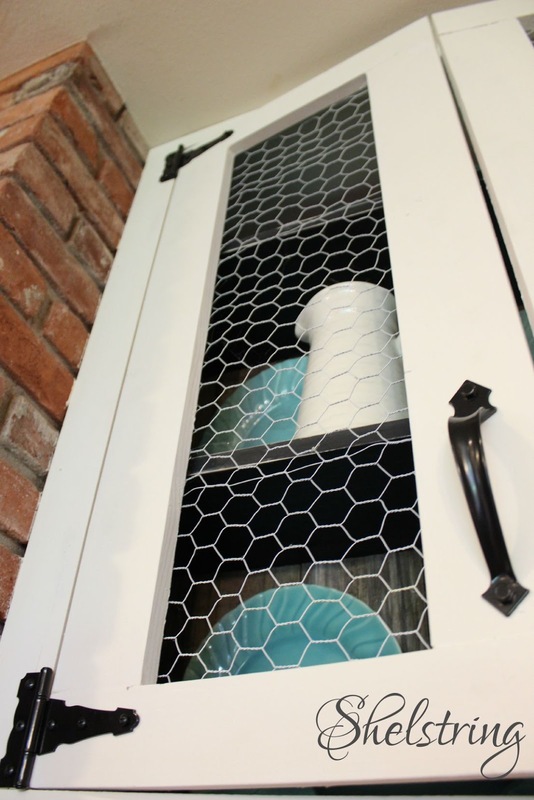 What a great redo--I love the wood on the back and the see thru chicken wire doors are perfect! You are a rock star! 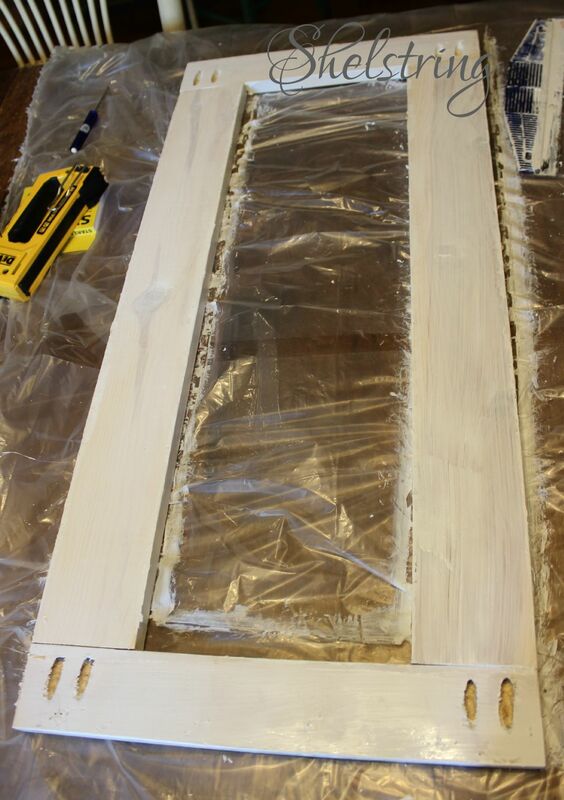 Creating doors from scratch...wow! 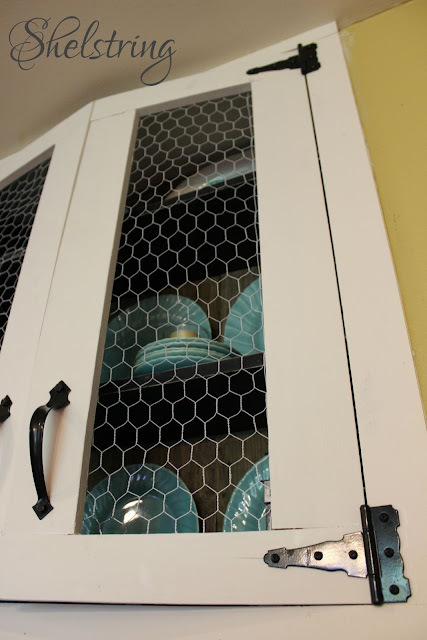 I just adore doors that have chicken wire inserts! The whole thing is wonderful!! Love this... I love how it looks with your dishes...well I like the whole set up...great job! 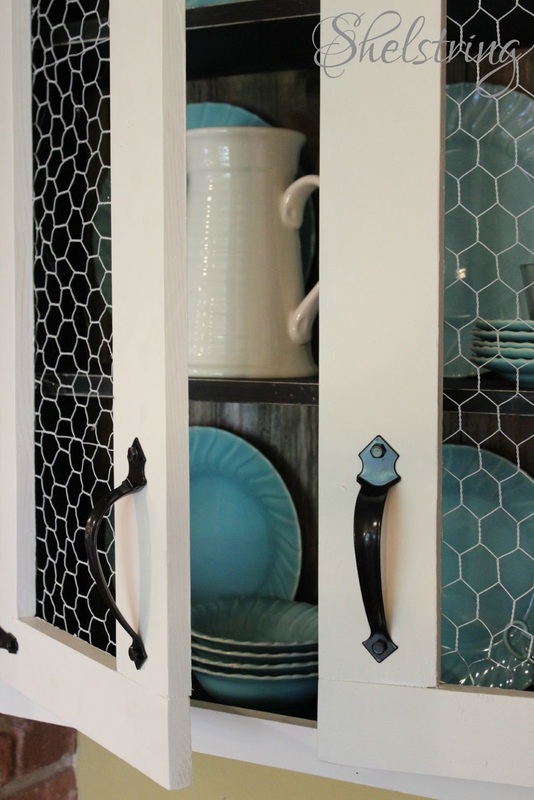 Love the doors and the dishes too! Awesome job! can't wait to see what you do with rust! I love this makeover! 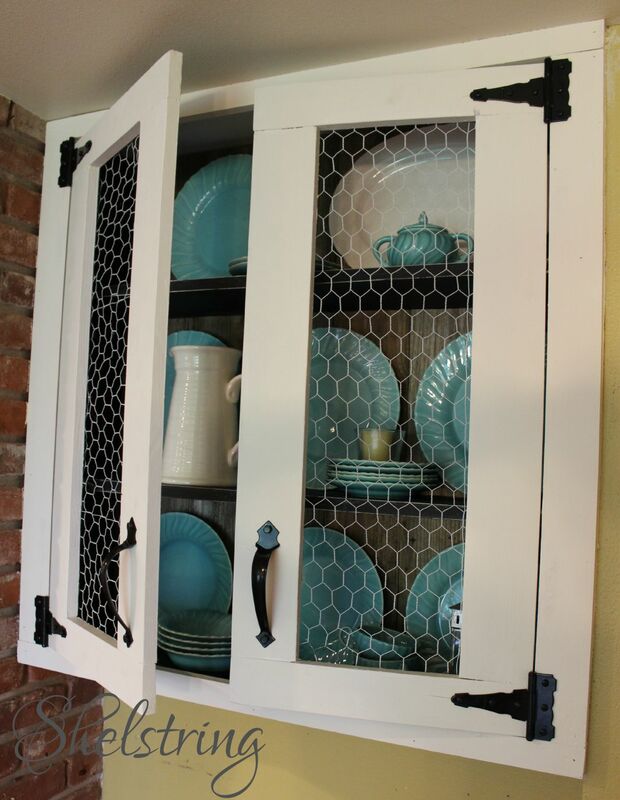 It looks so lovely with those dishes - and I LOVE the gate hinges and pulls - perfect! om my gosh...you went through a lot of work!!! It looks incredible!!!! Michele! 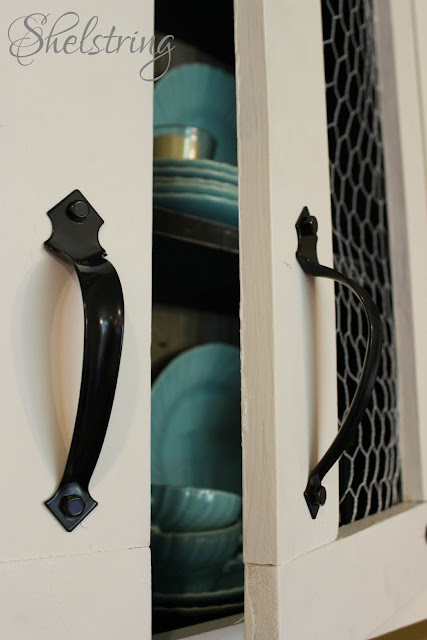 I am totally getting ready to do this to 2 of my cabinet doors. Great information.